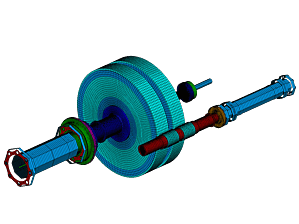 During test runs of a spur gearbox installed between an electric motor and a compressor, the wheel vibrations as well as the casing vibration exhibited very narrow-band resonances. An order analysis shows primarily the gear mesh frequency and multiples thereof. In addition, sidebands were observed, usually only on one side of the gear mesh frequency. In order to analyze this behavior, an FEA model of the gear set was created as shown in the top figure. A comparison of the analytical and numerical modal analyses showed a relative predictive accuracy better than 1% for the approx. 120 natural frequencies for the gear wheel, up to the maximum gear mesh frequency at 6 [kHz]. The narrow-band resonances observed in operation can be explained by the very low damping values for the corresponding gear wheel modes. As an example, the mid figure shows a relevant gear wheel mode at approx. 5.6 [kHz]. 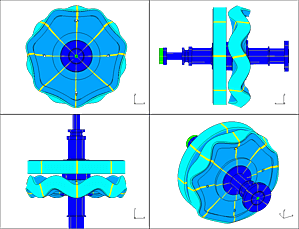 If the rotation of the gear wheel is not considered in the forced response analysis, characteristic deviations between the simulated gear wheel vibrations and the vibrations measured during operation were observed. 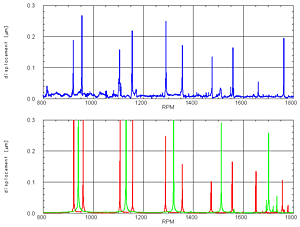 As shown in the bottom figure, resonance pairs were observed in the measurement (blue), while only single resonance points resulted from the simulation for the non-rotation wheel (green). However, if the rotation of the gear wheel is considered, an accuracy of better than 1% is achieved as indicated by the red curve in the bottom figure. Like in the measurements, the simulation predicts two resonance speeds for each natural frequency of the gear wheel. The single-sided sidebands observed during the measurements can also be explained by the rotation of the gear wheel. This topic has been published at the SIRM 2015 (german version).